BLOX Coilovers - Pann Auto Performance - San Diego largest aftermarket automotive performance parts - What do you drive? The Tuner Series is designed to meet the needs and demands of daily driving and high performance weekends at the local road course. The Competition Series is designed for the rigors of high performance road course driving and racing. Enthusiasts are able to fine tune and maximize their suspension set-up by easily adjusting their vehicle’s ride height and corner weights. 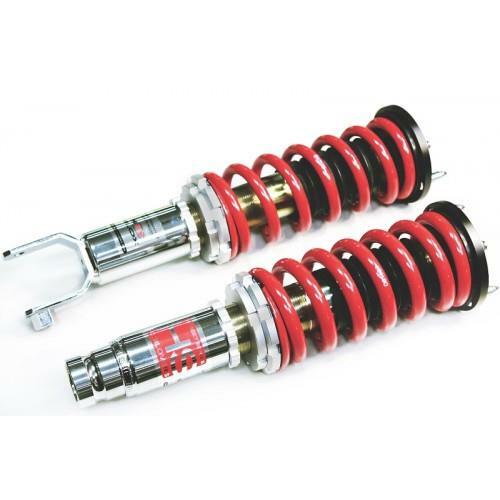 The Street Series HS Full-Bodied System is the best entry-level coilover available. It is designed to deliver maximum stance while still providing a comfortable ride. As with all BLOX Racing full-bodied coilover systems, the Street Series is proven to outperform other similar brands.